Boxing Training for the Coach and the Athlete. The box pattern padwork & bagwork for the conventional & southpaw boxer. Vol. 1-5 consists of 106 variations of training methods. The numbering system and foundation combinations are shown. Decipher the training methods needed to learn and teach the lost art of counter punching. This cutting-edge program teaches your boxers how to hit without being hit. Add a whole new dimension to your boxer’s training and your curriculum. enhance endurance, stamina, speed, power and coordination. Techniques on developing faster reflexes, decrease rection time, develop a multitude of boxing skills and reveal hidden talents through the use of punch mitts. Progress your physical ability to fire rapid combinations and quickly transition to new angles, develop key attributes to be a better athlete. By practicing a series of speed enhancing mitt drills and creating an overall greater understanding of what it takes to become a faster ring technician, you will find the answers you need in these training methods. Many boxers enter the gym each day and simply go through the motions. without thinking about doing that little something extra that would set them apart. Coach Chi-Tao Li’s training variations are what separates the ordinary boxer from the EXTRA-ordinary one. This program was designed to help you gain an edge over your opponents by maximizing the effectiveness of every training method that you execute in the gym. When most people think of boxing, visions of devastating right hands or left hooks come to mind. Yet there is another side of the sport that even seasoned coaches sometimes neglect…defense. Both basic and advanced defensive maneuvers are outlined and demonstrated allowing you to hit without being hit. As one of the most traditional pieces of equipment in the boxing gym, the heavybag is essential to developing a boxer’s complete arsenal. 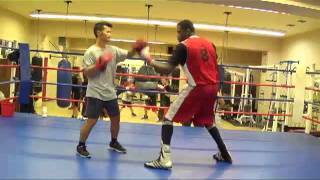 Various drills and techniques are dissected to help boxers develop and improve all aspects of their game, including range, distance, speed, power, and conditioning. Rediscover this indispensable training tool and sharpen your skills with every punch. staff for freestyle bag work. Boxing Training for the Coach and the Athlete. Boxing Training for the Coach and the Athlete. Countering Combinations 101 consists of 11 counter-punching combinations for conventional & 11 counter-punching combinations for southpaw. The numbering system and foundation combinations are shown. Decipher the training methods needed to learn and teach the lost art of counter punching.This cutting-edge program teaches your boxers how to hit without being hit.Add a whole new dimension to your boxer’s training and your curriculum.